This collection of pictures is not supposed to show all of our activities, but to give an idea of the diversity of actions we take to inform people and raise money for our projects. We are happy about new ideas and help with activities, so feel free to contact us! This page has been discontinued in 2014 - instead we post pictures on Twitter and Facebook. If you like online shopping use the chance to benefit our work with Boost - simple and effective! 1. December 2013: World Aids Day - diligent helpers collected more than 1.000 Euros on this day of remembering those who have died, and those who can and must still be supported. August 2013: Thanks to many donors and helpers we earned 750 Euro for the project at a fleamarket in Cologne. July 2013: Zumba Dance Action for Solidarity - together with several other initiatives we danced in front of the Cologne Cathedral and inspired many passers-by to join us. June 2013: Britta and Anna have visited our partner organization and many children. Their report is available here ->Projekte (German). April 2013: Second Cake Sale of the year brings another 300 Euro. Big thanks to everyone. February 2013: Andrea has visited one of the schools and activity centers close to Fuyang. January 2013: Thanks to many bakers and helpers we sold cakes for 330 Euro. Merry Christmas and Happy New Year to everyone. Read more on our work in 2012 in the annual letter of our board (German) ->Downloads. December 2012: We collected more than 1.200 Euro for the orphans - thanks to all helpers!!! September 2012: We have registered AIDS-Waisenhilfe at Boost - use your shopping to help us generate income! June 2012: Selling Cakes and waffles brings 434 Euro. May 2012: New Board: Britta Hupfeld, Jonas Keller, Verena Thelen, Stefan Winkelmann. October 2011: With donated valuables we organize a sale at one of Colognes big and fancy flea markets and earn 650 Euro. June 2011: As always the sale of cake, sandwiches and waffles is a big success. May 2011: For this year's international Night of Solidarity we organize a smart mob in front of Cologne main station and Cologne Cathedral with more than 50 people lying down in the form of an Aids solidarity ribbon. 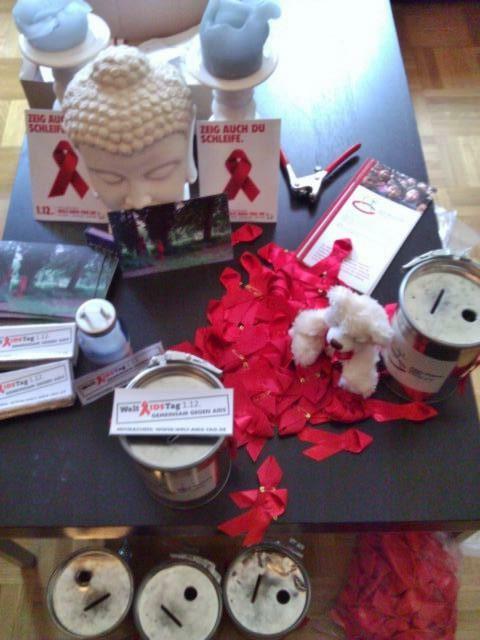 December 2010: On World Aids Day 15 members and helpers collect more than 1.000 Euro in the streets of Cologne. June 2010: Charity Poker tournament with professional tables and dealers (donated by pokerlust), 50 players + guests and a live stream of the football world championship in the "lounge" earns us donations of 850 Euro. May 2010: We organized the 7th Night of Solidarity for people living with HIV/Aids together with UNICEF and other Cologne charity organizations on a central place in Cologne with the support of several artists and a donation of 1.000 candles. Roughly 400 passers-by supported us by lighting a candle of hope and donating money. May 2010: Students of the East Asia Institute of the University of Cologne organize a "China Charity Party". All proceeds went to our projects. October 2009: After a long pause of almost 4 years we had gathered enough stuff to attempt another day at the flea market. We were lucky with the weather and the customers and collected 720 Euro for the project. June 2009: Together with UNICEF and two local charities we organized an event in Cologne to support the international 6. Night of Solidarity for People living with HIV/AIDS.1.000 candles were lit on a huge red awareness ribbon at the Rudolfplatz. February 2009: We present our project at the Chinese New Year festivities of the Association of Chinese Students in Cologne. June 2008: Prices worth more than 300 Euro were donated for a raffle at our bi-annual big party at the institute and the students donated freely - a fun activity for all involved and a nice extra sum for our project! June 2008: We organize the 5. Night of Solidarity for people living with HIV/AIDS on the Rudolfplatz in Cologne. More than 500 people lit up 1.000 candles of solidarity. The evening was supported by several musicians and bands from Cologne. We took many pictures of the evening, please visit http://www.bettinavonreden.de/nds/2008nds.html to look at them. March 2008: The Dreikönigsgymnasium of Cologne organizes a poker event and donates all income to us. Members take part and inform the students about our projects. A couple of days later 303 Euros are handed over by the students and the school's head administrator. December 2007: The four Cologne bands "Jim&Jon", "Kassette", "Radix vs. Raum 16" and "Lux" play a tribute concert for us and earn us some money as well as new supporters and publicity. June 2007: We invited the AIDS-Hilfe Köln, UNICEF and CARE to organize together the International Night of Solidarity with people affected by HIV/AIDS in Cologne and informed people about the illness and the plight of our children. 1000 candles were lighted by members of the organizations and passers-by for all who suffer fromHIV/ AIDS. Every six months we organize a "cake&coffee sale" in the Insitute of East Asian Studies, earning several hundred Euros each time. These pictures are of May 2007. March, June and December 2005: Members organize a charity market stand and earn several hundred Euros each time.